Brooks Mark II Junior Series M2JM Fire Extinguisher Cabinets with red tub and red cover features a breakaway cover for quick and easy access to fire extinguishers in an emergency. Pull to snap cover from cabinet to retrieve fire extinguisher. No glass to break. 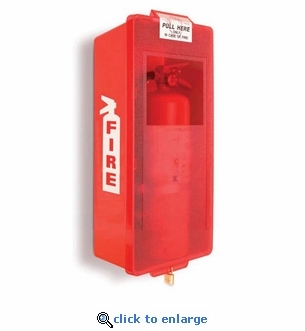 Can be used indoors or out to protect your fire extinguishers and make them noticeable and easy to access. Constructed of high-impact polystyrene and ultraviolet inhibitors, these surface mount extinguisher cabinets will not fade, regardless of the weather or environment. This M2JM cabinet is Recommended for Outdoor Use. Color: Red Tub with Red Cover.